1. 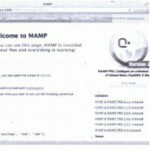 Connect to a MySQL installation. 2. 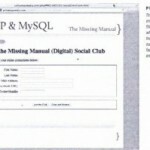 USE the correct MySQL database. 3. Send SQL to the database. 4. Get the results back. Not only is this shorter, but it flips things around a bit. It’s saying, “try to connect (using mysql_connect), and if the result isn’t true (the or part of the code), implement die.” Now, die prints out an error message, but it also “dies.” In other words, it ends your script. So, if mysql_ connect returns false, and die runs, your script will exit. 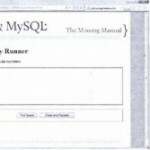 Your users won’t ever see the “Connected to MySQL!” line beCause the script will have stopped running. It’s dead on the server room floor, in search of a working database connection. Not only that, but mysql_ connect sets up another function when it can’t connect. It makes available the errors it ran into while trying to connect by using another command, mysql_ error. Thus, you can call mysql_ error as part of your die statement to show what really happened. Hopefully, you see one of the simplest, happiest messages of your bu.rgeoning PHP and MySQL programming career: you’re connected! 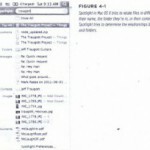 Check out Figure 5-2 to see the triumphant, if simple, result. That’s the same code you’ve already written, except it leaves off the die part. In fact, the slickest, highest-paid programmers in the world are error-handling gurus. At the sam~ime, they’re probably ,’at using die. They’re more likely to use a more robust error-handling system; something like the error handling in tnanter 8. For now, though, a healthy and liberal use of die will get you used to adding in a form of error handling. You can come back and improve upon it later. 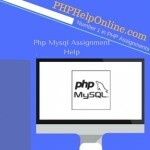 Now, you need to instruct MySQL which database your PHP script wants to use. There’s a function for that: mysql_ select _db. talking SQL to your database. Now that you have a connection, and you’re tied in to the right database, you need to see which tables are available on your hosting provider. When you were working directly with the MySQL command-line tool, one of the first things you did was to see what tables existed and then start creating tables of your own (page 100). You can do that same thing now with a PHP script and a little bit of simple output. This command does exactiy the same thing as when you type the SOL SHOW TABLES command into your command-line tool. But what about dieiWhat about error handling? There’s none of that yet. and by now, you know there should be. But there’s something different about this line: whatever comes back from mysql_query is stuffed into a variable called $result. 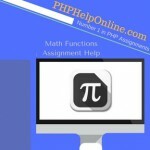 This example shows much better PHP, and now you have any problems covered . and it’lets you cycle through each row in the results returned from your SOL query. 1. 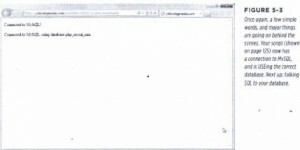 Write your SQL query and store it in a string or a variable. 2. 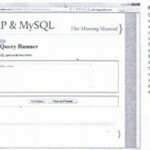 Pass your query into mysql_query and get back a PHP resource. 4. Cycle through those rows and pull out the information you need. 5. Buy a really nice musical instrument with all the cash you’re making. And then there’s that while loop, something else that’s new, but not tough to grasp. Finally, you’ve got a nice unordered list (cul > ready to emerge from each row. you might need to grab the value in $row[l], $row, or even $row. with a lot of tables. You might have only one or two, or none at all, and that’s fine. Just so long as you get a list of the tables that you do have or an empty response. What you )01; want here is an error.